Since the release of 11.1.2.5.520 we can now user Smart View with Windows 10 and Office 2016. I always suggest to keep updating your Smart View as this is the Oracle’s Strategic Office Integration Tool. So you might ask your Oracle Sales, what’s new in this Oracle BI EE version. Majority of the time, they will tell you a few features. Here’s the site, Cumulative Feature Overview. The objective of the tool is to help IT plan ahead to its upgrades and whether it is worth it. Obviously, I if you read my post on “OBIEE 11.1.1.9 Features that makes you upgrade today!”, you will find it absolutely worthwhile to upgrade! Oracle Smart View for Office 11.1.2.5.500 Patch 21635725 Out Now! I don’t usually send out information on Smart View patches but in OBIEE, there is one particularly resolved issue that needs to be highlighted and worthwhile to make your upgrade today. It is highlighted in blue below. 20295285 — Oracle BI EE content is not viewable in Smart View when called from an Oracle BI EE catalog shortcut link. 20698288, 20803386 — When retrieving data from a table in Oracle BI EE, the first column gets merged every 500th record. 20833815 — When more than three tables from Oracle BI EE are inserted into a worksheet, the cell positions of some tables are not maintained. 20912635 — Column order is not maintained in Smart View 11.1.2.5.200 after the BI Answers table is modified and a new column is inserted between two existing columns. Author Steve YeungPosted on 19 August, 2015 19 August, 2015 Categories SmartViewTags Essbase, OBIEE, Patch, SmartView1 Comment on Oracle Smart View for Office 11.1.2.5.500 Patch 21635725 Out Now! I am integrating Essbase and OBIEE. I have few measures (accounts) as date in Essbase, such as Receipt Date etc. Now when I fetch this in OBIEE, they appear as numbers. 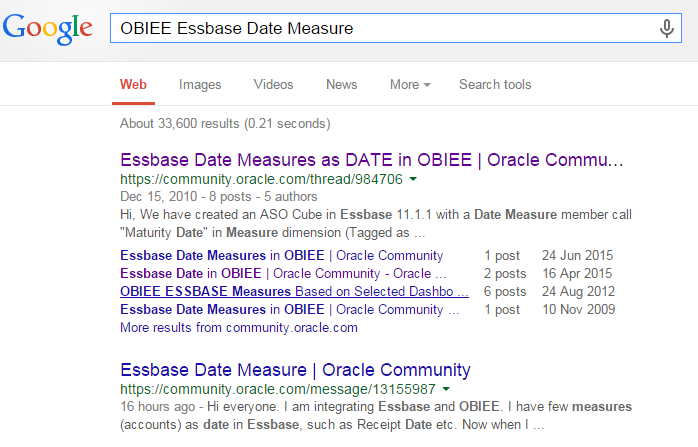 How to get date measures from Essbase to OBIEE exactly the way they are sitting in Essbase? And he’s right! They do appear as numbers. So I Googled and see how frequent this question is asked and if there were already answers I can refer him to. This is what I got! Opps, just questions, no answers! Questions like this comes in every few years. Saptarshi actually also posted in Oracle Community too, 16 hours ago! Good job Google! As promised last night, I’m going to demystify and give you a solution to this! In return, just like my Facebook page which was just launched yesterday! Click here! Taking Your OBIEE to the Next Level with SmartView VBA is meant to be for end users. Yes, it may sound techy, but with the help of macro recorders and Google it’s actually not that difficult after all. Thank you Oracle and OTN for publishing my article!!! And a special thank you to Bob Rhubart for making this happen!!! Top Gun 2015 – Thanks Guillaume Slee – Essbase as a Source and Bursting in OBIEE? Top Gun is one of the most technical conferences in UK that focuses strictly on Hyperion EPM. This year, thanks to Guillaume Slee, EPM Services Director of Brovanture, kindly used some of the materials from my blog. I feel extremely glad to be referenced in his presentations. I would also like to congratulate him for being voted The Most Popular Presentation out of the entire conference! And again, thank you for referencing my materials! Essbase as a Source & Bursting in OBIEE? Probably this was one of the questions asked in the conference? Interesting question, but with current Publisher, this could not be achieved for sure and I wouldn’t even try. Clearly because it is stated in the documents that SQL is the only available language for bursting in Publisher. Create native users from MaxL with the same bursting security. Say for example you wanted to burst the Customer dimension, then create the same number of users as Customers with the security setup as the customer itself. Create an Analysis report. Please don’t use Customer as a filter. You would want the customer to be displayed in the report. Remember to run as recipient. Add all the users you created with MaxL. Of course, they will also need id for OBIEE. Run this report and if everything is setup correctly, they will individually get a report and security of the report is handled through Essbase instead. This would be quite similar to bursting in Publisher but of course with a lot more setup effort. Personally, I would use HFR for such bursting needs unless absolute necessary. Author Steve YeungPosted on 17 April, 2015 Categories Essbase, OBIEETags Essbase, OBIEE1 Comment on Top Gun 2015 – Thanks Guillaume Slee – Essbase as a Source and Bursting in OBIEE?